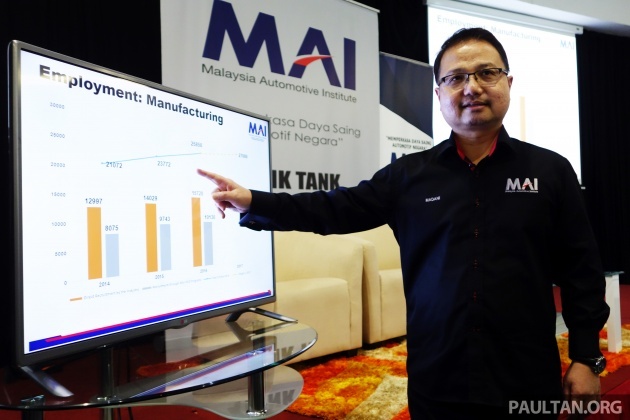 The third national car project is timely, as it can fulfil market needs in a bid to complete the automotive industry under the connected mobility concept, says Malaysia Automotive Institute (MAI) CEO Datuk Madani Sahari, reported by Bernama. “Technologies related to information technology and electronics will develop rapidly to prepare for such vehicles. This is one of the branches of R&D that can be developed if we have the (third) national car. The R&D that we have done are good but we must move forward, so we can develop R&D in the connected mobility segment,” he said on the national news agency’s Ruang Bicara programme last night. Madani, a supporter of the new national car project mooted by prime minister Tun Dr Mahathir Mohamad, dismissed the perception that the proposal by the PM was due to his frustration with Proton. “That is only a perception. The desire to develop the third national car project is not solely to gain fame but it will spur economic spillovers in terms of engineering as well as services. “For me, the development of the automotive industry is getting bigger as its scope is tremendous. The cake is big enough for the third national car to play a role. Of course, Proton and Perodua will play their respective roles but the third national car will be another national car entity,” he said. It’s no secret that many Malaysians aren’t supportive of the third national car project, something that Mahathir himself is fully aware of. “One thing I’ve learned in my line of work – one I consider a great honour and challenge – is the elimination of preconceived bias and assumptions to any issue. As a nation that is itself on a learning curve, we too must look at issues from both sides of the divide before forming an opinion,” the MAI man said in an opinion piece on paultan.org last month. At the end of the day, both camps are viewing it from their perspective. Consumers don’t want something shoved down their throats in the name of “patriotism”, and the snippets we’ve heard so far has been to the tune of “we must support local, shun foreign.” On the other hand, the government’s goal is to grow the local automotive industry and ecosystem, industrialisation via the auto industry, and being self-sufficient. You can read the latter argument by Madani in full here. Thoughts? Proton was created when malaysia population was only 18 mil. Perodua when we had about 22mil in 94. Today we have on circa of 33 mil. Cake is bigger but one cannot depend only on local market support. That was a terrible choice made by proton. Deswaii MAI Autoshow now got bigger local support. Local cake serve w kopi korek. MAI is a defunct organisation. Government spends about a hundred million per year just to keep MAI running. Until today, still never sorted high car prices, 30% car price reduction promise, and AP problem. Madani datang lagi dengan kemaslanan dia. 3rd national car only makes sense if Geely is involved. The rest can keep skin. Geely is so far behind on its EV technology. Look for kimchi for partnership better. Duplicate and merge Malaysia Automotive Institute (MAI) + Automobile Association of Malaysia (AAM). This guy ,his name sounds like permaidani…better dress like middle east guy,and start selling permaidani…makes more sense. Just pathetic to have people talking crap. Not good to say bad about one’s name lah. You argue with facts lah not with nonsense. This guy again. Another load of Hot Air, shoe polishing and brown nosing. How does he even justify “room” for another national car brand? This guy can’t even predict the TIV correctly. As it is, Proton can’t even survive. We don’t have the market to support 2, let alone 3 automakers. You don’t have to be an automaker to get RnD and research. One can be a RnD house and just do engineering research…and develop technology and products for ALL AUTOMAKERS. To justify a 3rd automaker, just for RnD simply means he is trying to justify doing up an automaker just to support RnD. Where is his priorities??? What bull crap logic is this?? Want to build another white elephant? As it is, our local automakers do little to nothing to support any RnD on new tech. The best we can come up is a teh Tarik hook and most of the parts used by the automakers are off the shelf parts from different vendors. The automaker parts suppliers should already been doing their own RnD after 30 years patronage by our local automakers and assemblers. Apa kereta SiMani pakai? Honda atau Toyota? Cakap besar atau role model? Its not the market is big enough..its the current price to peeformance/spec leaving a lot of wanting and demamds unaddressed for. Any price protection for any players within the industry is bad for an overall industry growth. using public coffers to build and sell tax-free EVs back to goverment while charging them exorbitant maintenace fees…..
Madani…what a joke. He wanted to keep his job only. Why is this guy still around? Can’t provide answer on national radio when asked about Proton. Elak sini, elak sana. Tok Madani veli cekap …rebadge je Swift Sport. Go Full Electric if its 3rd National Car. by the time all the investment set up, hybrid would be the norm and electric would be the next step, the 3rd car need export market, if still have the stone age thinking of malaysian market, karma will back again. one can than impose 30% tax lower for such vehicle like many countries have practise. He just say that so that he dun lose his job. Kipas, jgn tak kipas bang oi! 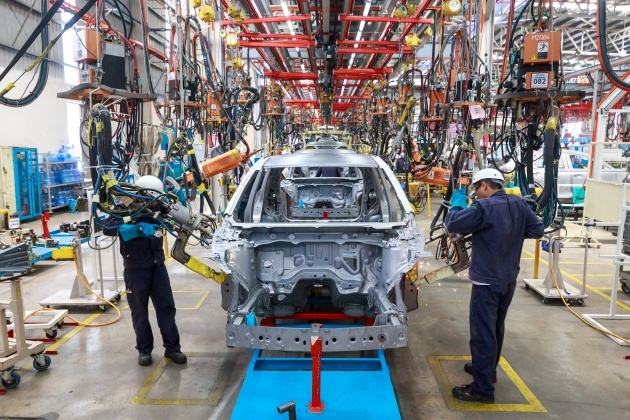 The auto making industry is moving forward with full robotic automation. Minimal manpower labor is required means minimal employment opportunities. Otherwise the only way to create more employment is moving backward using labor intensive manufacturing process. PM met Dyson in London yesterday, pushing for more investment by Dyson into this country. But why? Instead, we should design and make our own vacuum cleaners: more engineering work for locals. Smart-vacuum with AI technology! National vacuum cleaner brand and then export to other markets! What, do you guys want to live in wooden house for the rest of your life? No? Then we better make our own vacuum cleaners! Dyson initiatives on upcomming electric car project. Hehehe. Next Manifesto: Lets stop all foreign devil impots! Only locally made for local pipu! Bapak will make MY great again! has the mechanical competency been achieved? are we really ready for the IT and electronics aspects of automotive? one thing everyone learns in life (not just work) – learn from past mistakes and avoid the same. no? This is indeed a big joke when a lot of those renowned car manufacturers are already merging and consolidating, but yet we are still toying this idea of starting a new automotive brand ourselves. Err.. Is he dared enough to say “Auto cake is NOT big enough for third national car – MAI” considering his new paymaster said otherwise? Say something just to please Tun M! 2) No subsidy or government money or any form of liability from Malaysia Government! We will accept it openly even the owner of the new national car is the son of Tun M! He should work in a cake house. His boss did. But it failed miserably. and so on. CEO Datuk Madani Sahari is only concern he will have a job. Why would we want to drive inferior cars at higher prices, which is going to happen. In 1995 my wife drove a Satria at RM50.000 and there were no other options. Today the cost is the same, which was highway robbery then by the government. Unless they can compete in a level playing field which I doubt very much will happen. Focus on other important industries like food and herb production (Security) so that we do not rely on imports. Think out of the box and think about making the Malaysians healthy, instead of chasing pipe dreams. Leave the car industry to the experts like Japan, Korea, Germans, Chinese Etc. Third national car, is it????? We must ask Madani how much share he will be given in the 3rd National Car Project? Of course the cake is enough if he is not too greedy. Come on, please don’t treat the rakyat as idiots.